Flemish Etiquette implores you to wait and see if your host offers a toast before sipping your drink. 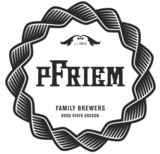 Where his Belgian Strong Blonde is concerned Pfriem sees things differently. Waiting to taste a perfect harmony of strength and elegance, while sniffing its pear and clove bouquet is like torture. Clean maltiness, invigorating effervescence and just enough bitterness wait for no one.